THIS ITEM IS STAMPED MFP 7-54 (MOISTURE AND FUNGUS PROOFING JULY, 1954). It also has several inspection stamps internally that show the year 1954. 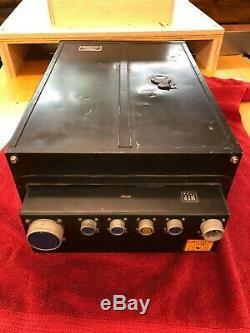 If anybody has any additional information about this unit it would be greatly appreciated if it could be passed along. We have over 110 images of this item for those that are serious about purchasing and would like to see more details. The outer metal cover or sleeve is easily removed. This is done by removing the four stainless steel socket head cap screws and then sliding the cover off. 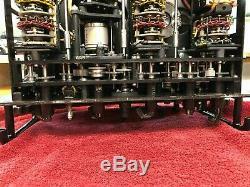 This reveals the mechanical jungle of moving parts inside the unit. 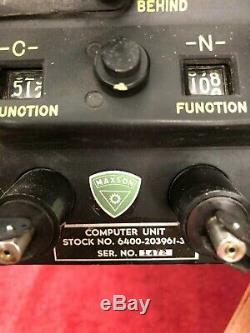 This item comes with an electrical schematic and a diagram of all of the electrical connectors on the rear of the unit and it indicates which pin needs voltage(and how much) to make all of the panel lamps operate or the other various lamps on the front of the machine. Every single one of the miniature light bulbs on the front of this machine works. They were tested with 12 V DC. It also includes three spare light bulbs which were also tested and all work. When voltage is applied to the correct location on the back of the unit all of the panel lamps light up. 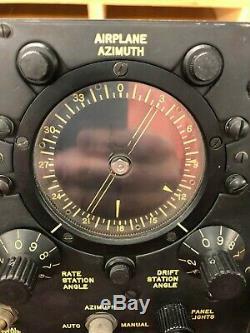 All of the counting indicators and airplane azimuth are lit by these tiny G.
If Rube Goldberg or Alan Turing were alive to see the mechanisms inside of this they would be dumbfounded. The quality of all of the mechanical components inside of this machine is astounding. 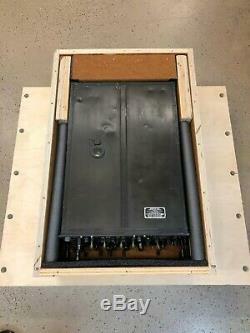 What is really nice about this piece is that it does not need to be hooked up to power to control all of the mechanical functions on the machine. All of the cranks on the front of the machine all operate and turn the mechanics in the machine. Once all of the settings are input into the machine (programmed) the cranks fold over 180 degrees which disengages the crank from the mechanics and locks the settings in place. 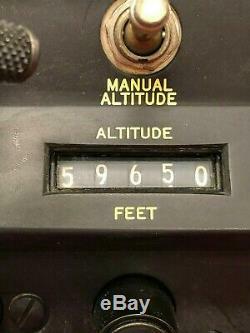 This way vibration from aircraft engines would not change the settings of the machine. 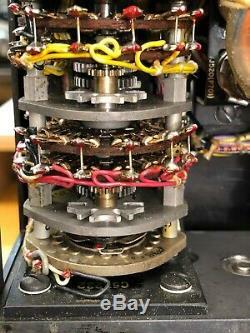 One of the more interesting mechanical features of this computer is the hexadecimal logic circuitry. This circuitry is controlled by several large rotary contact switches. The switches work in conjunction with a series of geneva stop mechanisms. These are 6 position (index dwell) 60 degree geneva stops. 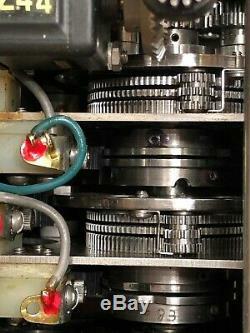 All of this can be seen operating by turning the various cranks and dials on the front of the machine. Also all of the counting mechanisms on the front of the machine work perfectly as they are supposed to as the correct dial is turned. Another interesting mechanism inside of this unit is a series of planetary gears that rotate around multiple gears that differ from one another by just one tooth. This creates a very large reduction ratio to make several of the components operate at different rotational speeds. 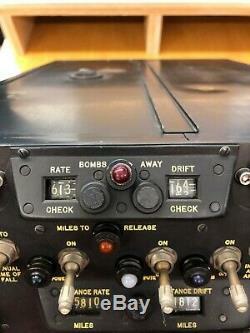 This assembly rotates very slowly and has several cams that operate a series of snap action micro switches to control the logic gates to determine when and if a bomb is to be released from the bomb bay of the aircraft. Obviously this device is ancient technology. 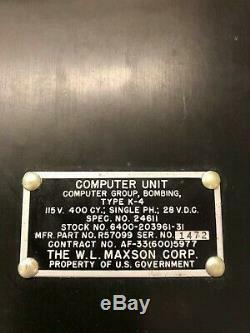 This computer is completely worthless to drop a bomb unless you also happen to possess a B-36 peacemaker and a nuclear bomb. This is a very rare piece of aviation and warfare history. 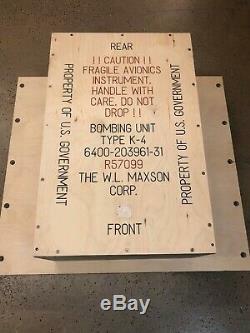 I personally believe that this belongs in a museum like Wright-Patterson Air Force Base or the Smithsonian museum. I will sell this to anyone as long as they live in the United States and it is delivered to an address in the United States. Once the item is picked up I will provide you with the tracking information. 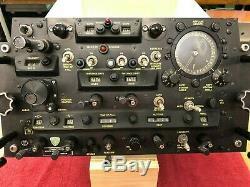 The item "VINTAGE ELECTRO-MECHANICAL NUCLEAR BOMB COMPUTER US ARMY/AIR FORCE B-52 B-36" is in sale since Friday, March 22, 2019. This item is in the category "Collectibles\Militaria\1954-60\Original Period Items". The seller is "antiques-virginia-1875" and is located in McCordsville, Indiana. This item can be shipped to United States.